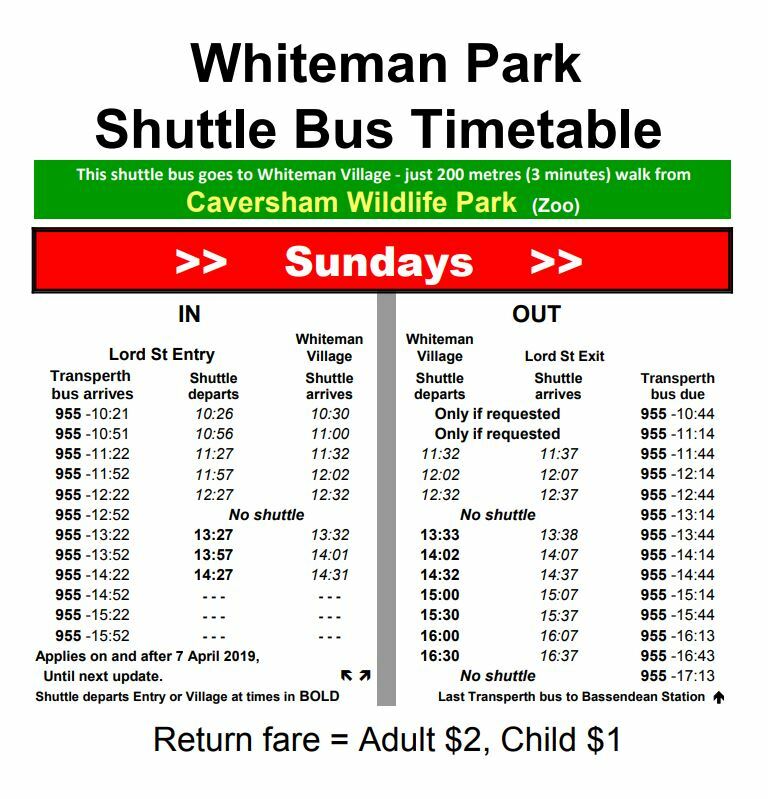 In association with Whiteman Park, the Bus Preservation Society of WA provides a Shuttle Service for visitors from the Lord Street entrance of Whiteman Park into the village and return and is designed to connect with the 955 bus passing the Lord Street Gate entrance/exit. The service is provided by volunteer drivers from the Bus Preservation Society of WA and operates on Saturdays and Sundays throughout the year. 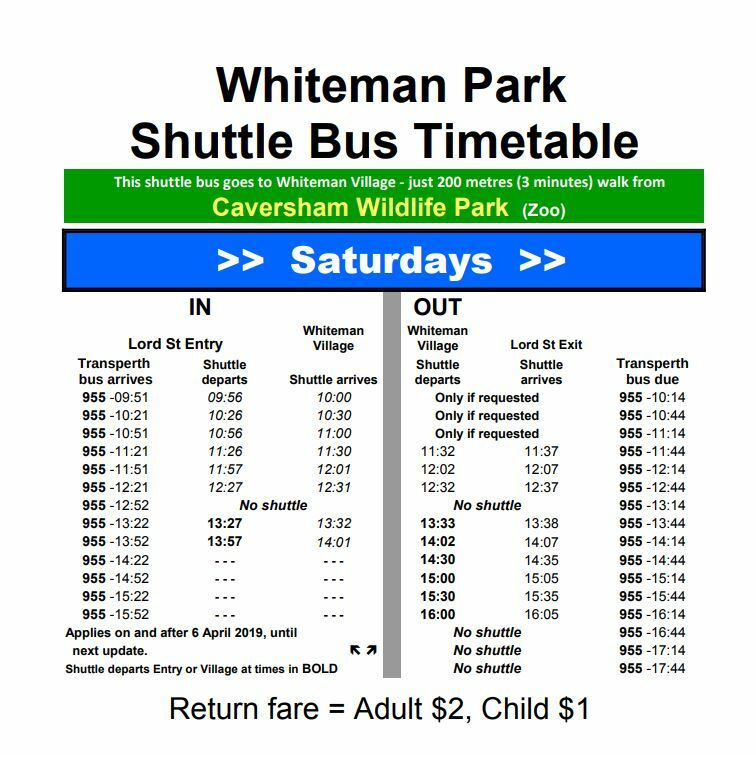 Timetables for the Shuttle Service are available below, including a PDF copy for download. The Whiteman Park Administration has set a fee of $2 for this service. Children under 5 years of age travel free. This entitles the ticket holder to travel on our buses while in the park, upon presentation of the ticket. Tickets are issued to passengers when boarding the bus at the commencement of their first journey for the day. The Park also operates the free 'Explorer' Guided Bus Tours within the Park on Monday's. Check the Whiteman Park Website for details or make enquiries with the Information Office Located in the Village, adjacent to Car Park 7 on phone (08) 9209 6000. # Some regional areas in WA hold the Queen's Birthday public holiday on a different date - dates are published in the Regional public holiday dates page when gazetted. The shuttle timetables as shown may change at very short notice due to the ongoing Lord Street road construction project and changes to the Transperth bus 955 timetable. This new service operating within Whiteman Park will provide the public with a unique opportunity to ride on magnificent buses from a bygone era that have been lovingly restored by the Bus Preservation Society of WA. The Hop On Hop Off Heritage Bus Service departs from the carpark outside the Visitor Information Centre in the Village every 45 minutes between 10:30 am to 3:45 pm on the first and third Sunday each month. Look for the orange bus stop post and experience a trip back in time to when your parents and grandparents would travel on these buses throughout Perth in the 1940's, 1950's, 1960's and 1970's. Fares are only $5 for adults and children travel for free. Hop on and hop off as often as you like over the whole day for the one simple fare. Travel on the actual buses that plied the streets of Perth in the middle and later part of last century and relive the Perth public transport past.